Tonight I combined a couple challenges into one card to send to a friend who's birthday is today. Oops, a little late! 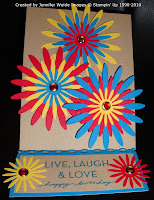 I started out thinking stars for the 4th of July, but settled on the Daisy die to imitate fireworks bursting in air! The challenges I'm playing along with are Pals Paper Arts and Always Playing with Paper. The result is this easel card. I've wanted to do another one since I did them with the Club girls last month and this was the perfect opportunity! Card base is Crumb Cake (formerly Kraft). The Bursts (daisies) were cut in Daffodil Delight, Real Red & Pacific Point. I layered them together, put a Rhinestone Brad in the center and attached them with a dimensional. For the layer inside I cut a Pacific Point layer and edged the top with the Scallop Trim Border punch, added two small bursts to the side and stamped the Live, Laugh & Love saying in Pacific Point. Such a festive card! I love the easel design! Thanks for playing @ PPA! Jennifer another fabulous card. I love the flowers as a take on a starburst theme. I bet your friend really appreciated this very creative card! Thanks for joining the Paper Players challenge again this week. I love these colours ... I'm a fan of bright colours and so this is just perfect! Great job! Can't wait to see what you make next! Your card just jumped out at me over at Paper Pals. I love all the colors you used...festive and pretty. Happy 4th!